A competitive marketplace is what provides us with the wide variety of goods we see today - from an array of budget breakfast cereals to look-alike designer clothes. A company's desire to maximize profit and the consumer's quest for the best deal fuel an ever changing and improving marketplace. This course, Microeconomics: Competition in the Marketplace, will teach you all the aspects of competition in the marketplace. This course will first introduce you to externalities, which are a form of market failure that fall on bystanders. You will look into the types of costs as well as the Pigouvian tax, which is a tax on a good with an external cost. You will learn how firms maximize profits and that in a competitive market, a firm has no control over its price because the market determines the price. You will then learn the properties of the invisible hand as well as the elimination principle on profits, including their implications. You will look into monopolies and learn how monopolists have market power. You will look into the low elasticity of demand as well as patent. The course will teach you why patents can be particularly important in industries such as pharmaceuticals. 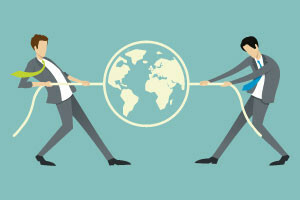 Having an in-depth understanding of the competition in the marketplace can help every business entrepreneur or manager devise a strategy that will benefit their organization as well as satisfy their customers' needs and wants. This course is the third in a series of four courses on Microeconomics, so if you have finished the courses Microeconomics: Supply, Demand, and Equilibrium as well as the Microeconomics: Price and Trade, take this course now and continue learning about microeconomics. Define private, external, social costs and Pigouvian taxes. Discuss externalities, both costs and benefits. Explain social surplus, fixed costs, variable costs, marginal costs, zero costs, and sunk costs. Compare increasing, decreasing, and constant cost industries. Discuss when it is best to enter or exit an industry. Explain the properties of the invisible hand. Discuss how monopolies create markups.